In this generation there are so many sites which present the biblical story dressed in cross-cultural trappings. I will feature several sites later which is uniquely Asian, but I want to start with African Jesus. 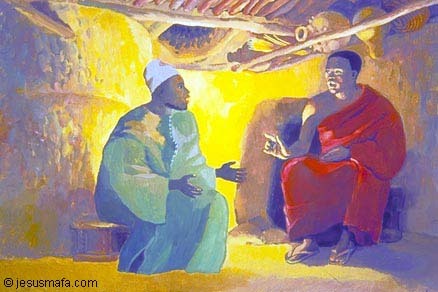 The MAFA pictures are a coherent set of African illustrations of the Gospel. They permit a good visualisation of the Sunday mass texts for the believer's faith, the catechist's comment and the celebrant's homely. Moreover they lead to prayer and, in a spirit of acculturation, the contemplation of a black Jesus. So why an African Christ? Click here to read the reasons! URL" http://www.jesusmafa.com/anglais/pagetprod2.htm The catalogue contains 7 parts: Part one: Virgins with the Child, Part two: Childhood of Jesus, Part Three: Life and Teaching of Jesus, Part four: Miracles of Jesus, Part five: Parables, Part six: Passion of Jesus, and Part seven: Jesus has been raised. The seven parts show the 65 pictures of LIFE OF JESUS MAFA. 62 evangelic scenes and 3 pictures of Virgins with the Child.